CESI-MS is used by BioPharma Leaders for the analysis of intact biologics such as monoclonal antibodies (mAbs) and Erythropoietin (EPO), peptide mapping, disulfide mapping, identification of post-translational modifications, and antibody drug conjugates (ADCs). Intact Biologics – CESI-MS is able to quickly and accurately characterize intact proteins for product quality, purity, and safety assessments. Peptide Mapping – CESI-MS has exceptional separation efficiency for peptide -- (especially the very short or very long, or highly charged peptides) and glycopeptide mapping of mAbs, differentiating between Asp and IsoAsp deamidation and other PTMs – with the ability to provide 100% coverage from a single enzyme digestion in a single analysis. Identification of Post-Translational Modifications – CESI-MS readily separates and increases sensitivity of deamidated, glycosylated, citrullinated, phosphorylated, and other PTMs. Antibody Drug Conjugates – CESI-MS allows for the separation of various ADCs with confident analysis of drug antibody ratio. 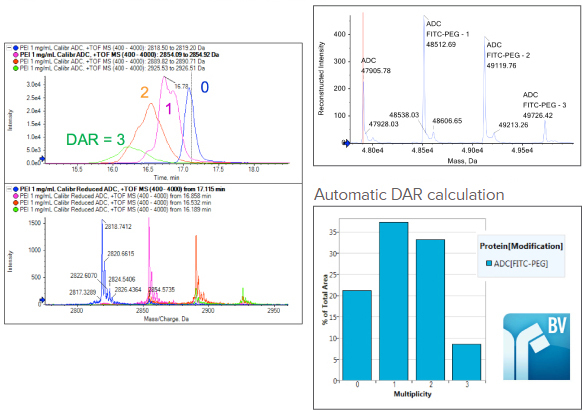 Intact Antibody Drug Conjugate (ADC) analysis showing separated protein peaks at Drug Antibody Ratios (DAR) of 1, 2, 3, and 4.